When Sarah McCloskey became a new mother, she worried that she and her husband would have to give up an essential part of their lives together. “Marc and I share a love for the outdoors,” she says. “We were going to pursue these epic and adventurous journeys together. I was worried that all these plans would come to a halt.” But Sarah decided that she was not going to stay home with the baby. In fact, not even the baby was going to stay home. 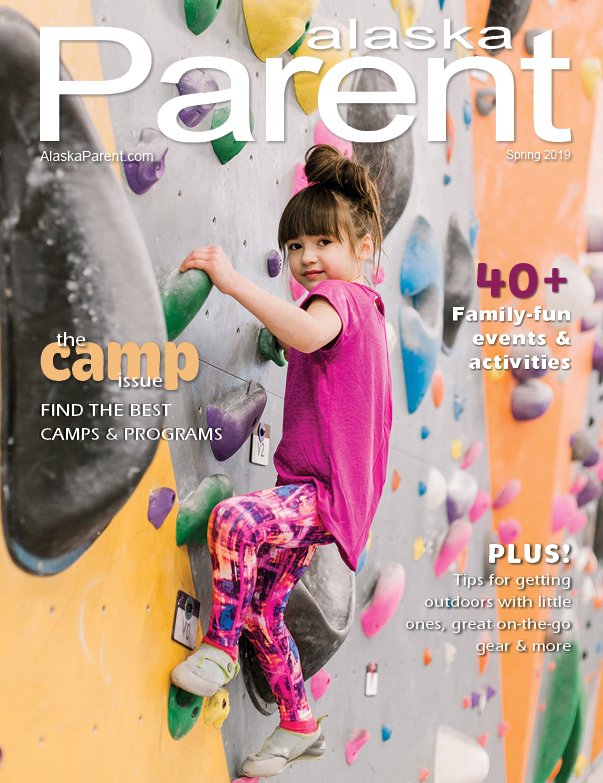 Whether you’re an experienced camper or an “indoor enthusiast,” new parenthood should inspire you to get outside with your children. “Early exposure to nature and the outdoors is so important,” says Jen. “If you look at any aspect of child development – physical, intellectual, emotional – all the research says that time spent in nature is critical.” Early exposure helps them develop “a healthy habit,” she says. If you’re new to camping, take baby steps toward becoming a family of adventurers. “It doesn’t have to be epic,” says Jen. 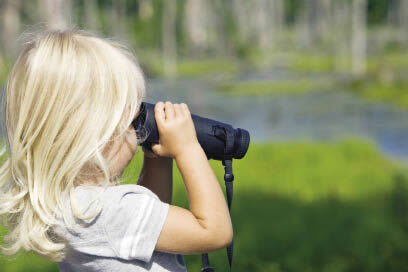 “Having fun in the outdoors can happen in your backyard. It can happen at the park or in a walk around the block.” And then you can build on your experiences. “We’re so fortunate to live on the fringe of wilderness,” says Erin. “You don’t have to go far to experience the outdoors in a way that few people get to.” Campgrounds in Eagle River, Portage Valley, and the Mat-Su Valley are close by and many offer comfortable facilities such as bathrooms, bear-proof lockers, and site pads. Both Kirkland’s website (www.akonthego.com) and Jen’s (www.wildernessforkids.com) offer many specific suggestions for family-friendly campsites around the state. 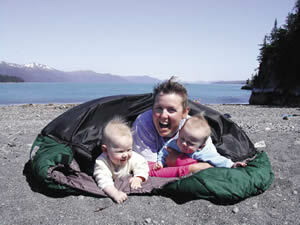 "Early exposure to nature and the outdoors is so important," says Jen Aist, shown here camping with her two children. Whether you’re planning a one-night trip to a cozy cabin, or a multi-day backpacking trek, packing is paramount. “There’s no one magic gear list,” says Jen. You have to think systematically, she says. Consider the season and the weather – what you’ll need for rain, sun, wind or bugs. 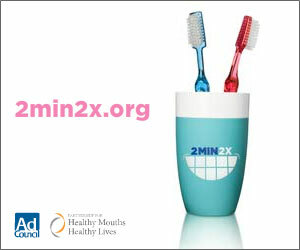 Consider food – what you’ll eat and how you’ll eat it. Consider sleep. Consider clothes. And so on. “You start out with long lists,” says Jen, “and then you pare down depending on the type of trip.” Going car camping? Bring it all! But if you’re backpacking, she says, “You have to ask yourself what you have to have and what it would be nice to have.” You may need a few trial runs before you know what you can live without, she says. Jen loves her hammock. “I wish I had them when I was camping with nursing babies,” she says. “What could be better than hanging out with your baby in a tree?” Compact, weighing only a pound, the Aist family takes their hammock on every trip. Erin loves Therm-a-Rest pads. “If everyone has their own cozy, sleeping area, the kiddos are more likely to do well at night.” She adds good rain gear to the list. “Don’t skimp on rain gear,” she says. “Go quality. It doesn’t matter if the weather’s wet as long as you and your baby stay dry.” Bogs, she says, are a great investment. Her son wears them in summer and winter – they’re warm and completely waterproof. Lastly, everyone agrees that a good quality tent is crucial. Nothing, says Jen, is worse than getting wet in your tent. Go to REI, she says. “They have demo tents set up. Get in there with your family,” she says. “Lie down. Make sure you’re all going to fit.” Also, she says, make sure you can set the tent up easily and that you won’t have to “bring an engineer with you.” And if you don’t see what you like on the floor, she says, ask them to bring other ones out and set them up. “They’re great about that,” she says. Lastly, says Erin, expect the unexpected. Things will happen. Like on her family’s bug-ridden camping trip when their mosquito shelter ended up in Lake Louise, and some neighboring dogs howled all night (possibly because an eagle had eaten their dog food), and then, of course, it rained. “Alaska is a little challenging,” says Erin. “But it’s so, so worth it. Even when things go wrong.” And, she says, those are the times that you talk about – and hopefully laugh about – over the dinner table.